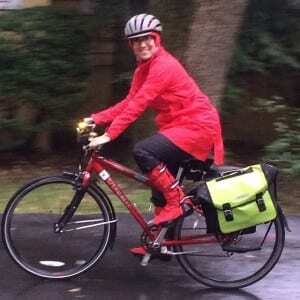 Let’s face it – many people perceive bicyclists as arrogant. Let’s look at one too-typical letter to the editor, where someone leads off with the arrogance charge, and see if we can determine the causes and underlying assumptions of this perception. “Arrogant bicyclists endanger us all on roads. It’s that time of the year again. Yup, the bicyclists are out in mass, riding two abreast and showing no respect for anyone’s vehicle except their own. They choose to ride on narrow two-lane roads with very narrow shoulders, which forces them into the auto lanes and is extremely dangerous for all. Our county, township and state have spent thousands of dollars to construct bike paths for the many cyclists out there, so why do they have to infringe on our roadways? I know we are supposed to share the road. But it’s not sharing the road when I and other drivers have to slow down and cross the median strip so that these clowns can talk to each other while out for their morning cruise. If the above was not the norm, I could live with these arrogant bike riders. But most of them ride like they own the road. They actually taunt us to hit them. They run red lights, do not stop for walkers in the crossing lane, and get obnoxious when questioned about their actions. There’s selective perception that cyclists disobey the law, e.g. “They run red lights, do not stop for walkers in the crossing lane,” implying that no motorist would ever do those same things. The writer notes “something has to be done before someone is seriously injured by these cyclists’ callous actions,” perhaps not realizing that it is almost certainly the cyclists themselves who will be hurt in the event of a crash, not a motorist. Perhaps you’re thinking to yourself – “this blogger is one of those arrogant cyclists.” Since we’re looking at calling other people arrogant, for a working definition let’s use “behaving in a way that makes me think you believe you are superior.” I’ll respectfully suggest that others’ “arrogant behavior” is highly dependent on your own social and cultural values and expectations, and that sometimes just acting equal is enough to be called arrogant – like riding a bike in the roadway. Thoughts? The WWBPA is once again accepting applications from high school seniors in the West Windsor-Plainsboro school district or who live in West Windsor. Up to $1,000 in scholarship money (no more than $500 to one student) is available. Applicants are required to write a short essay or create a short video on a topic relating to bicycle and pedestrian safety. Click Here to download the new application, which is due April 15, 2015. So, how much money do you save by bike commuting? Probably a lot, but let’s run the numbers. First, the car expense – according to the AAA’s Your Driving Costs 2014 report, operating a small sedan costs $7930/year, while a SUV runs $12,446/year, including gas, maintenance, depreciation, insurance, loan interest, etc. What about biking expenses? Elly Blue, author of Bikenomics, refers us to transportation economist Todd Littman’s 2011 research, which gives a range of $100-$300 per year for operating costs, which is comparable to AAA’s numbers, since it includes depreciated cost of the bike, etc. Typical bike maintenance is easy enough to learn that many people do it themselves – fixing a flat tire, lubing a chain, adjusting brakes – a web search shows numerous how-to videos that are very instructive. 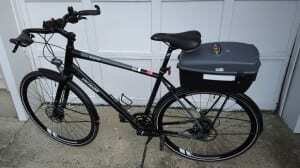 Blogger James Schwartz assumed $50 per year for maintaining a $1500 commuter bike. Clearly, bike commuting saves a lot of money if you can actually reduce the number of cars you own, since you can buy multiple high quality new bikes and gear every year for much less than the operating costs of even a small sedan. But it is very difficult in the suburbs to go car free, so what if you only have one car? Then the savings will only be based on reduced miles driven, which saves on gas, maintenance, tires and depreciation. According to the AAA report, the operating costs (gas, maintenance, tires) for a small sedan is 16.3 cents/mile, and 23.8 cents/mile for a SUV. If your commute is 2 miles each way, like mine, then 4 miles roundtrip x 240 working days/year equals 960 miles biked each year. The 960 mile reduction in driving would save $156.48 (operating costs) plus $33.60 (reduced depreciation), totaling $190.08 for a small sedan, and $228.48 (operating costs) plus $48.96 for (reduced depreciation), totaling $277.44 for an SUV. This is in the range for paying for the annual bike costs, but hardly a killer incentive by itself. It will help if your employer offers you the IRS Bicycle Commuter Tax Benefit – you can be reimbursed up to $240 each year for bike commuting expenses. Of course you might choose to use the commuter bike for other errands, such as small grocery runs, to the bank, post office, etc. Since only 15% of our trips are for commuting, that leaves a lot of other trips that could be done by bike – e.g. 40% of all trips are 2 miles or less, and if you take the bike/walk trips out of the denominator, 69% of car trips are 2 miles or less. Of course, you’ll save more in indirect costs, for example if you substitute biking for a gym membership, that could save about $1000/year. And the potential for saving money on health care is huge, since you may be much healthier with regular activity. Perhaps most important, it’s fun! Of course, you’ll also be saving the world by reducing greenhouse gas emissions, since car exhaust is the single largest contributor in our area to CO2 emissions. Last, longtime WWBPA readers might notice a strong resemblance between the bike commuter pictured above and the bike lane fairy, who hasn’t made a public appearance recently. Could this be why? Please join us at the New Jersey Bike and Walk Summit next Saturday, February 21 – we’ll keep an eye out, you never know when you might see her next. Made a few changes to the commuter bike in the year it’s been flogged every day 2 miles to the office and back – for reference, see last year’s post Accessorizing the Commuter Bike. You may notice a little extra reflective tape on the trunk box, for example. There were two main issues – pain in the shoulder, caused by the straight handlebar, and pain in the neck, caused by dealing with the hydraulic disc brakes (mental pain, not physical). Swapping the straight handlebar for a mustache bar provided the hand position that prevented shoulder pain (yep, even on a ten minute ride). Tried new grips, which didn’t help, then swapped the grips from my mountain bike to this bike – when that didn’t help it had to be the bar, because those grips are very comfortable on the mountain bike’s straight handlebar. The less obviously self-inflicted issue was dealing with the hydraulic disc brakes. One time, some idiot took off the wheel to put on the winter tires and closed the brake lever. You probably know that if you don’t have something for the brake to grab (disc, credit card, cardboard, etc.) it will not open back up, and the wheel will not go back on. Anyway, back to the shop to have the brake lines bled, and not for the 1st time. The first time back to the shop was after a few months of winter riding and the lever went all the way to the handle without stopping much. Another time was to get the brakes to stop screeching, and to put some silicone around the fender rivets so they stopped rattling. The last straw was when some road gook got into the front brake on a ride to Hopewell, and I fought and listened to the tick from the brake all the way back to West Windsor, because there’s no way to loosen the calipers on hydraulic brakes in the field. I’d had enough – they were simply not idiot-proof enough for this idiot. The new mechanical disc brakes not only have ways to loosen them, they have dials for making adjustments and a fancy way to automatically align the calipers. It sure sounds good. On the sound advice from the good folks at the shop, let’s talk about bike maintenance and keeping your bike clean. If (like a certain someone) you just ride it and occasionally lube the chain (sometimes after wiping the main gook off), you will have a much harder time pedaling by the end of the year – maybe because the derailleur pulleys rust into place. Really, it’s a wonder I could pedal at all. You might think this would encourage better bike cleaning, but instead it has me thinking about belt drives – anyone have experience to share?